Why are Developed Countries Lagging Behind in the Commitment to End Violence Against Children? 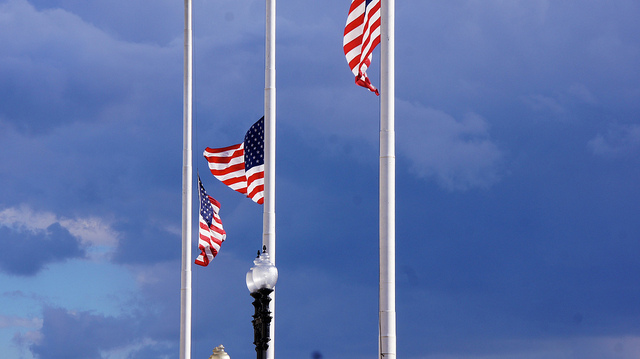 United States Flag at half-mast in Washington, D.C. Photo courtesy of Ted Eytan via Flickr Commons. “Living with violence is not living.” These were the unequivocal words of 17-year-old Raphael Harriohay at the Global Summit to End Violence against Children in Stockholm, Sweden in February 2018. He was speaking on behalf of the children represented at the Summit. His words were uttered around the same time as the Parkland, Florida mass shooting took place, as children from Marjory Stoneman Douglas High School were hiding under their desks, fleeing their school building, and watching as their teachers and friends were mowed down by gunfire. Over the coming weeks and months, the children of Parkland, Florida will come to know the tragic truth of these words first hand. Violence does not end when an incident has passed. Its effects are sustained long after the last bullet is fired, or the last wound stitched. We feel those effects in our bodies manifesting as chronic aches and pains. We feel them emotionally, as depression, fear, and anxiety. We feel it hampering our concentration and our ability to work and focus. Emma Gonzalez of Marjory Stoneman Douglas High School and her peers understand this in a way few adults and children who have not experienced violence firsthand do. Emma has become an instant celebrity and has received overwhelming support for her brave speech calling for gun control. However, not all the children will have the affirming experiences Emma has. Every child experiences and reacts to trauma differently. Children who are resilient and have strong support systems are likely to recover much more quickly than their peers who do not. Nevertheless, regardless of how resilient they are the experience of violence will change their lives forever. It is not just a tragic, high-profile incident like a school massacre that warrants action. Many children experience more insidious and less visible forms of violence. Violence takes place daily in homes, in schools, and in our neighborhoods. Gun violence is on the extreme end of the spectrum of violence children are exposed to, but bullying, corporal punishment, neglect, and gang violence all have negative long-term consequences. According to a report by Know Violence—released at the end of 2017—1.7 billion children experience some form of violence worldwide each year. Violence against children bears massive economic costs. Economists at the Copenhagen Consensus believe violence against children costs 4.3 percent of global GDP annually, and others believe the number is much higher. A study by Save the Children South Africa found that violence against children costs the country USD $20.4 billion a year in direct costs and lost opportunities. In Australia, the cost is estimated to be more than AUS$124 billion annually. The Centers for Disease Control put the cost to the United States at between $125 and $585 billion a year. Furthermore, wherever they are in the world, children who experience violence are likely to earn less than those who do not when they enter the job market, suffer from more mental and physical health problems, and are more likely to perpetuate the cycle of violence either as victims or as perpetrators. We know how pervasive and pernicious the problem of violence is. We know how much and what it costs us. We also know that children in developed countries are as vulnerable and almost as likely to experience violence in their lives as children in the developing world. For example, studies by the UBS Optimus Foundation in Switzerland, South Africa, and China found that in all of these countries around one in three children report experiencing some form of sexual abuse. Now thanks to the World Health Organization (WHO), we also know what works to solve it. The INSPIRE package by the WHO presents seven strategies for preventing violence against children, all of which are quite achievable in most countries across the world. However, implementation depends on the actions and commitment of politicians. Fifteen countries have joined the Global Partnership to End Violence against Children as ‘Pathfinders,’ with Japan, Brazil, and the United Arab Emirates announcing their intention to sign up at the Summit. This will bring the number of Pathfinder countries to 18. These countries have committed themselves to achieving Sustainable Development Goal 16.2: “to end abuse, exploitation, trafficking and all forms of violence and torture against children.” This is not because the problem of violence against children in their countries is necessarily worse than elsewhere, or because they already have the solutions figured out. These countries have acknowledged the importance of combatting violence against children and are prepared to have their efforts measured and reported on. Only one of the current Pathfinder countries is a developed economy, that being Sweden. Even though the United Kingdom participated in the Summit—and invests heavily in finding out what works to prevent and reduce violence against children and gender-based violence in the developed and developing world—they have not committed to being a Pathfinder country. Nor has the United States, or any other country in the European Union, other than Romania. Among the countries that have signed up are Mexico, Brazil, South Africa, Uganda, Tanzania, El Salvador, Montenegro, and the Philippines. Is this because it is more comfortable for developed countries to present violence against children as a problem for countries other than their own? Is it because policymakers in the developed world do not know or understand the seriousness of the problem in their own communities? Is it because developed countries prefer to be seen as benefactors rather than having the problem themselves? Perhaps it is also not a problem politicians in developed countries wish to bring to the attention of their electorate, as they will be held accountable for fixing the problem. Without a doubt, there is a lot that still needs to be done in the countries that have become Pathfinders. For example my own country—South Africa—has an unacceptably high rate of child homicide (double the global average) and the use of corporal punishment by parents is not prohibited by law. However, I am quite certain that the children in Parkland, Florida will agree that there is good reason to focus on preventing violence in the United States as well. Developed countries should demonstrate their commitment to ending violence against children. They should also hold themselves to the same standards that they hold others to. In the words of Ola Rosling of the Gapminder Foundation (that makes available facts and figures to correct misconceptions about global development): “We have to stop violence against children because it makes sense, and it’s crazy not to do it. That is where the smart investment is – in creating loving societies that care.” No country can afford not to. Chandre Gould is a Senior Research Fellow for the Justice and Violence Prevention Program at the Institute for Security Studies in South Africa. She is a current Southern Voices Network for Peacebuilding Scholar for the Spring 2018 term.